OFFSET functions help makes the calculation dynamic by making the lookup range to be dynamic as you can move it up, down, left or right. Lets understand how this works. If you have Department 1 selected then it is cell A1. If cells are merged, then cell address is of the top left most cell. =OFFSET(A1,4,4,1,1) and it will return 215 which is the sales value of East region of product CC for the month of JAN. So what really happened? 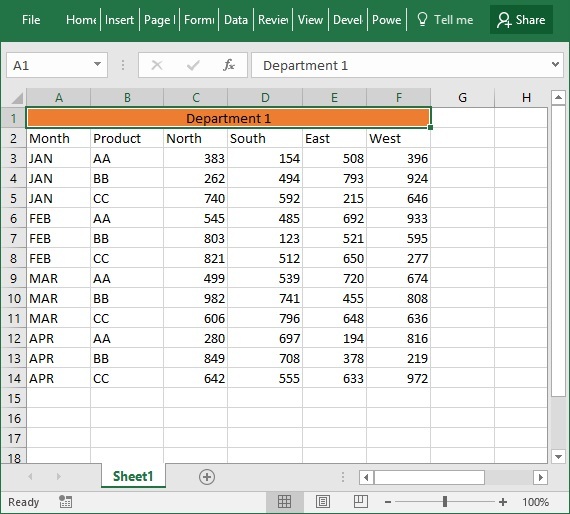 You asked Excel to offset or simply displace starting from cell A1 and move 4 rows under reaching cell A5, once here move 4 columns to the right thus reaching cell E5 and fetch reference which is 1 row high and 1 column wide thus returning the value in cell E5.